Louis XIV: King of France (roi de France) 1643-1715; born 5 September 1638, the son of King Louis XIII of France (1601-1643) and Anne of Austria (1601-1666). He succeeded his father when he was not yet five years old, and reigned for 72 years. Louis married his double first cousin, Maria Theresa of Spain (1638-1683). Louis died 1 September 1715 and was succeeded by his great-grandson, Louis XV (1710-1774). Louis intended to make France an absolute monarchy. Although he was strictly Catholic, he did not permit the pope to interfere in any political affairs. Very energetically he defended Catholic customs and usage, which were called freedoms of the Gallic church. He was also a zealous promoter of religious unity in France. There were in the kingdom many Protestants, to whom Henry IV had guaranteed freedom of conscience and certain political rights in the Edict of Nantes (1598). Richelieu, the minister of Louis XIII, had withdrawn these political rights. Now Louis XIV proceeded to restrict their freedom of conscience. What was not expressly promised in the Edict was prohibited. All means were used to convert the Protestants. The most terrible of these was the compulsory quartering of troops, who were guilty of all sorts of violence, upon the unfortunate ones, until they declared themselves ready to recant. The large numbers of conversions were announced and celebrated with great rejoicing. Finally the Jesuits persuaded the king that there were practically no Protestants left in France and that the Edict was therefore meaningless. It was repealed in 1685. The remaining Protestants were forbidden to leave the country on threat of being sentenced to the galleys. Nevertheless hundreds and thousands of them fled over the borders and brought their fund of knowledge, particularly in industry, to their new home. Although Alsace had been French since 1648, it was not affected by the Edict of Nantes, since the Peace of Westphalia had assured it freedom of conscience. But there were many Mennonites in Alsace. Against them the king was particularly prejudiced. In France the name Anabaptists had the effect of a bogey; it suggested only the Peasant Revolt and the revolt of Münster. But the Alsatian Mennonites were quiet, and the government of the newly acquired province was so complicated that they escaped notice for many years. The attention of the king was directed to the Mennonites when he came into conflict with the Dutch States-General. But here he heard only favorable reports about them. Some time previously General Turenne had met with the Dutch Ambassador M. van Beuningen. Turenne censured the States-General for tolerating so many sects, especially the Anabaptists. The statesman replied: "Why should we not tolerate the Anabaptists? They are such good people and so easy to get along with. They do not seek honor and regard, so they are in nobody's way. We do not fear revolt from a sect which has as one of the articles of its faith a prohibition against carrying arms. The Mennonites pay their share of all public taxes, and that suffices us. With their taxes we pay mercenaries who are more useful to us in the army than they could be. They build us up by the purity of their morals. They carry on agriculture, industry, and trade without wasting what they earn in luxury or gluttony. People of other creeds frequently do not act thus but by their excesses are a public offense and a great injury to the state. To be sure they refuse to render an oath, but that is of no significance, for their promise to speak the truth binds them like an oath" (Michiels, 104 f). In 1672, when the French army marched into Holland, Louis XIV sent Raymond Formantyn to get information about the Mennonites and make a report. The learned man went to Emmerich to the book dealer van Beughem. Since they did not understand each other's language they conversed in Latin. Van Beughem summoned the Mennonite preacher Heinrich van Voorst and served as interpreter for him. Formantyn was amazed at the Biblical knowledge of the Mennonite. He looked up in a French Bible the references cited and underlined them. After a two days' discussion they departed on friendly terms and Formantyn promised to give a favorable report. But the effect of this report was not evident, for Louis XIV had to withdraw from the country. The French troops retreated to Alsace via the Palatinate, doing a great deal of damage (1674). The unfortunate Palatinate, to which many Mennonites from Switzerland had fled, was devastated again in 1689. But the hour of persecution was also to strike for the Alsatian Mennonites. There were many of them in the gravure Rappoltstein and especially around Ste.-Marie-aux-Mines, where they had achieved a certain economic position through their industry, rousing the envy of their neighbors, especially since they were exempt from military service. Complaints reached Versailles. In the name of the king, de la Houssaye issued a circular on 9 September 1712 requiring that all Anabaptists be expelled from the kingdom. They turned to the gravure of Montbéliard, which at that time belonged to Württemberg, to the duchy of Lorraine, to Zweibrücken, and to the Breisgau in Baden. The count of Rappoltstein at that time was Christian II von Birkenfeld, a captain in the French army, a favorite of the king. Although it meant a great loss to his country, he had to carry out the king's command exactly, whereas other lords in Alsace were more lenient. It seems that the numerous Mennonites living in Upper Alsace and especially in the Sundgau (south of Altkirch) were not molested. Also in Rappoltstein they were again tolerated on a petition by the count, at least a certain number of families. Louis XIV died in 1715. Under his successors the Mennonites again enjoyed relative peace on the condition that they would draw no public attention to themselves. In 1766, when Lorraine became French, inquiries were made about them; but since the reports were favorable they were tolerated until finally the French Revolution brought religious freedom to all. Hege, Christian and Christian Neff. Mennonitisches Lexikon, 4 vols. Frankfurt & Weierhof: Hege; Karlsruhe: Schneider, 1913-1967: v. II, 697 f.
Michiels, Alfred. Les Anabaptistes des Vosges. Paris, 1860. Sommer, Pierre and Richard D. Thiessen. "Louis XIV, King of France (1638-1715)." Global Anabaptist Mennonite Encyclopedia Online. December 2007. Web. 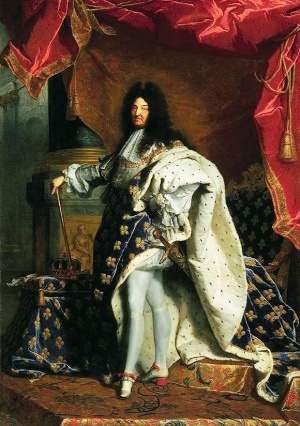 24 Apr 2019. http://gameo.org/index.php?title=Louis_XIV,_King_of_France_(1638-1715)&oldid=145729. Sommer, Pierre and Richard D. Thiessen. (December 2007). Louis XIV, King of France (1638-1715). Global Anabaptist Mennonite Encyclopedia Online. Retrieved 24 April 2019, from http://gameo.org/index.php?title=Louis_XIV,_King_of_France_(1638-1715)&oldid=145729. Adapted by permission of Herald Press, Harrisonburg, Virginia, from Mennonite Encyclopedia, Vol. 3, pp. 401-402. All rights reserved.